I have set myself a challenge for 2012. At some point during 2011 I promised myself I would sew at least one garment from every Burda magazine I own unless I had already sewn something from it. This fell apart pretty quickly, partly because I’m pretty sure it was well into the year when I decided to do this, and partly because I couldn’t decide on a way to pick which pattern to sew from so many magazines. I’ve decided to try again in 2012. I currently have 49 issues of the magazine, starting with a few issues from 2007 and 2008 and a full year for each of 2009 (excluding May), 2010 and 2011. From these I have sewn at least one garment from 13 of the issues, leaving 36 with nothing sewn. Of course, I will then have to add a further 12 issues to this number as my 2012 issues arrive each month, bringing the total to 48 (and now I’ve just typed that number I’ve already scared myself with this challenge). Dealing with how to pick which patterns I’m going to sew each month, I thought that I might take every issue I’ve got for each month. For example, I have the January issues for 2009, 2010, 2011 and will receive 2012 sometime soon. That means four garments from January issues to be sewn in January (or at least sometime during 2012). This gets a bit scary when I get to months such as July when I will have, including the newest issue, six garments to sew. I do know that from some of the magazines I may sew nothing, because I have quite a few issues where nothing has jumped out at me and I don’t want to sew something just for the sake of a challenge, but I will be honest in my future posts and will admit when I haven’t sewn because I can’t be bothered, and when I haven’t sewn because the issue just doesn’t really interest me. There is a danger that I will end up with 48 new skirts by the end of the year because I find them easiest to sew! I think the hardest part of this is going to be the fact that the patterns have to be traced and a fair few of them will need a muslin (if I don’t want to end up with 48 skirts). Now I think about it, I will also count a muslin that doesn’t work for me as something sewn from that magazine. For example this dress didn’t work because of the fabric, but I’m still counting this as an item sewn from the 11-2008 issue. So that’s zero down, 48 to go. 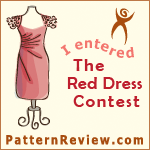 This entry was posted in Burda Challenge, Sewing Plans and tagged Burda, challenge. Bookmark the permalink. You’re good! I’m sort of glad I can’t contemplate joining you because Burda is 6 months out of season for me, but I have just subscribed to Manequim, a Brazilian pattern magazine. I should be able to sew something from every month of that now, shouldn’t I?! Not that I’m making that commitment yet… until I get the first issue. I’m not sure that I’d be brave enough to try this with Manequim. It’s hard enough sewing with English instructions, let alone Portuguese. Good luck if you do decide to set yourself a challenge. Hi SewingElle! I just moved to Brazil and was wondering where to find Brazilian sewing stores and patterns. I’m in Rio, would you happen to know this area? There’s a good chance that SewingElle won’t see your comment unless she happens to come back to this thread so I thought I’d reply for her. She doesn’t live in Brazil, just subscribes to a Brazilian magazine. She lives in Australia. I hope you do join in. I wish I’d though of this back in 2007 when I only had six issues, instead of now :). I’ve just spent today going though all my magazines trying to plan and I’m now up to 51 garments because three of the issues have already been sewn from, but also have something in them that I really want to make and have already bought the fabric. I suppose I should find one more thing so that I have one thing per week to sew – gulp! hmmmm…excellent challenge idea! Let’s see…I’ve got 11 Burda magazine….hhmmmm…let me think about it but I might join in! This is a great idea, but after doing a few of the sew weekly challenges I’m more apt to make 1 or 2 garments a month, it’s such a time issue for me. I have a year of Burda magazines, I’ll have to revisit them. I may do something like this but cast a wider net on pattern source. BTW I had seen your post on Mena’s 2012 challenge and hopped over here, your blog is fantastic, I like your style (I too have a love of skirts so I have learned) and will have to visit more often, you have great inspiration! I love reading about personal sewing challenges. I too have created a personal sewing challenge for 2012. I really like yours and have even thought about doing something like this a few times. Hope 2012 goes well for and I’ll be following along. Good luck on your new years challenge.. Look forward to seeing what you make with the burda magazines.. Happy sewing. I am excited to see what you do with your challenge! I made myself a sewing challenge for this year, but mine is more focused on creating a wardrobe. I really like your Burda challenge though – great way to use the pattern stash. I only found Burda at the start of last year, and I am working on building a collection of older issues. The more Burda I sew, the more I want to sew, so I actually decided to impose the opposite rule for my year-long challenge – I am trying to sew from as many sources as possible, otherwise I would probably sew almost entirely with my Burda magazine patterns. In either case, can’t wait to see what you end up making!